Wake Forest University is a private research university in Winston-Salem, North Carolina. Famous alumni include author Maya Angelou, golfer Arnold Palmer, and NBA stars Chris Paul, Tim Duncan and Muggsy Bogues. Founded in 1834, the school has produced 15 Rhodes Scholars and is part of the NCAA’s prestigious ACC athletic conference. 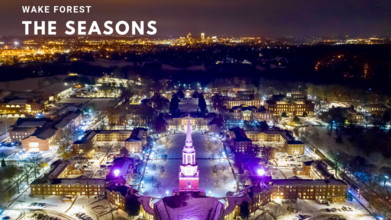 See the historic school's BB&T Field, Wait Chapel, Benson University Center and more throughout all four seasons in this 4K drone video by CLupton.